In mid 2015, US ran out of IPv4 addresses. This is the 32-bit addressing system we’ve relied on since the 80s. And it supports around 4.3 billion IPs. 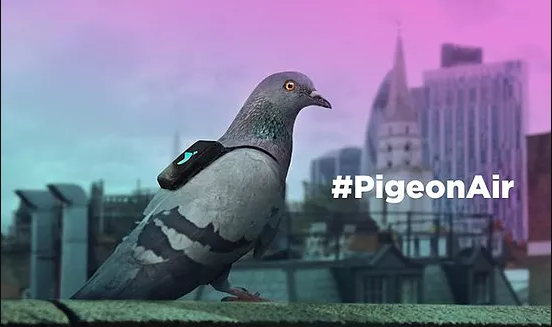 I often refer to it as the 'Internet of Pigeons'. We’re adding connected devices at an exponential pace. Since a while now, it’s been rather easy to put together connected devices. Integration takes work no doubt, but the technology itself is rather mainstream. Many imagine IoT to be these discretely sized, yet swarm like, ubiquitous devices. But whether its cars, homes, warehouses or personal assistants, they’re all getting connected. They’re all IoT. Typically, security is the most discussed concern when it comes to internet connected things. 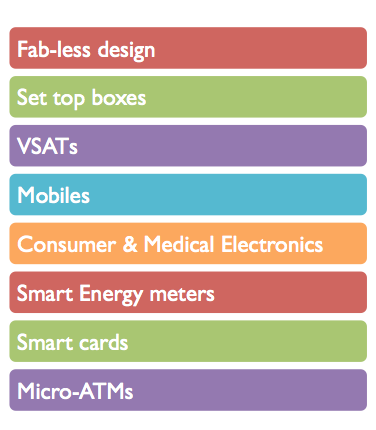 So, I’ve put together a list of some of the lesser heard challenges of IoT. My last post, 'The Power Of Presentations' was based on my experiences as a presenter. So it was only fair, that I wrote a follow up post from another perspective; the perspective in which I was at the receiving end of presentations. Most points listed below stand true for presentations of any kind. But these here are drawn specifically from interactions with PR agencies. Individually or collectively, these mistakes made by agency personnel ended up sticking out like a sore thumb or worse, failed to win them the business all together. So, here go the 7. If you are a PR agency, then a new client has reached out to you, since they have a reasonably established intent to improve their public image or outreach. And you're trying to demonstrate that you understand their business & products well. 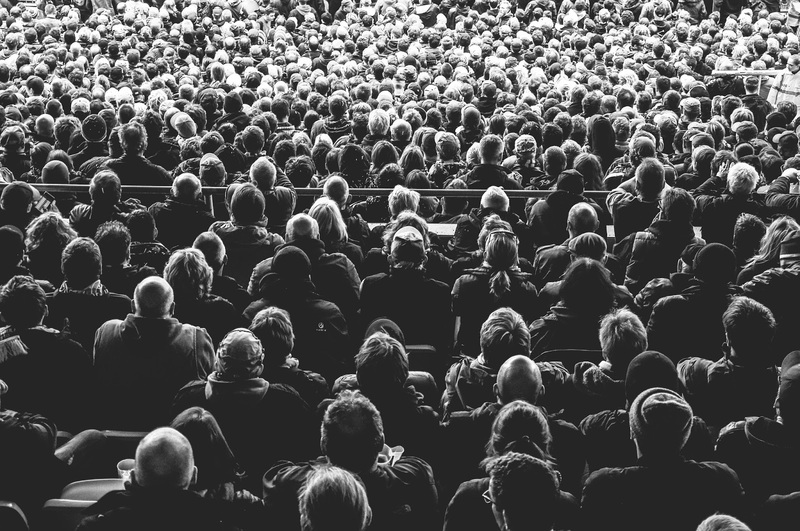 Consequently, besides showcasing how you plan to address their needs, you also need to showcase that you see the problems they currently have, and even the ones which they've probably overlooked. To do this, you'll need to research extensively on their recent outreach campaigns, their markets, their business models, and even their partners' & competitors' outreach programs. No amount of team swag can compensate for sub-standard research. 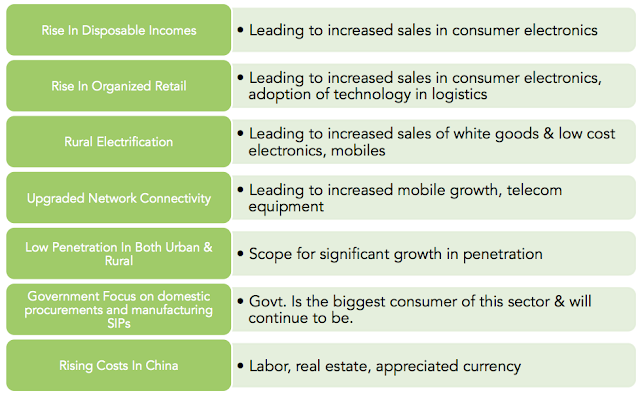 There has been a significant interest in India's electronics import burden. 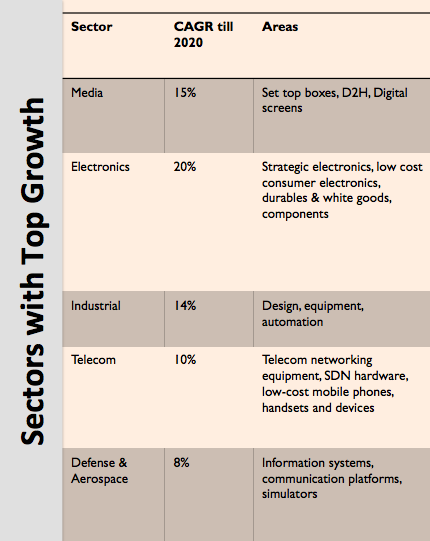 Though many revisions have been made in the projections, what is for certain is that several key issues will drive India's consumption and growth of electronics and ESDM industry in general. The above are the big ticket items identified by DeitY for 2016. But micro-ATMs deserve a special mention. Micro ATMs are expected to be viable where ATMs are not. ATMs need at least 80-100 transactions a day to be viable as they a lot and and have monthly operating expenses of close to Rs 20,000 after taking into account rental, telecom charges, AMC costs, electricity expenses and security guard. A micro ATM costs less than Rs 20,000. It is widely expected that payment banks will use micro ATMs to reach out to rural poor to bring down their cost of operations. In 2008, I came across a remote village in India’s Western Ghats which was doing something unique. The village was re-introducing a native fish species into the local river, the numbers of which had dwindled considerably due to a recent dam upstream. Every year, they'd import live fry from other parts of India and release them in the streams around. The river was the village’s lifeline and had been supporting them for generations. So in many ways, besides being a river rejuvenation project, it was also an economic one. The project drew me strongly and I realized how it could be made more effective while improving rural employability. So, in less than a week's time, I located the village and found myself sitting with the village elders, presenting about the nuances of the project. That presentation, and the discussions following lasted for four hours. But, by the end of it, I had won their trust. I helped run their efforts for the next two years. [Update] As further proof of what's below, FTSE 100 is now trading higher than what it was at pre BREXIT. 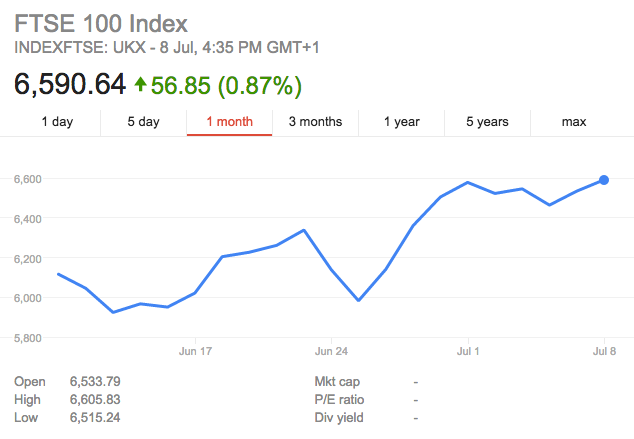 [Original Post] The after math of BREXIT shook up several markets. FTSE 250, which is a composite of very UK centric businesses took a severe hit that morning, and so did FTSE 100. FTSE 100 is composed of firms which draw less than 30% of their revenue from inside the UK. So, amid all noise of doom and despair, you'd expect scrips of any kind fall. At least that was the prediction by several from the media and a few from my peers. But, here's what sets the case for existence of an intelligent investor.